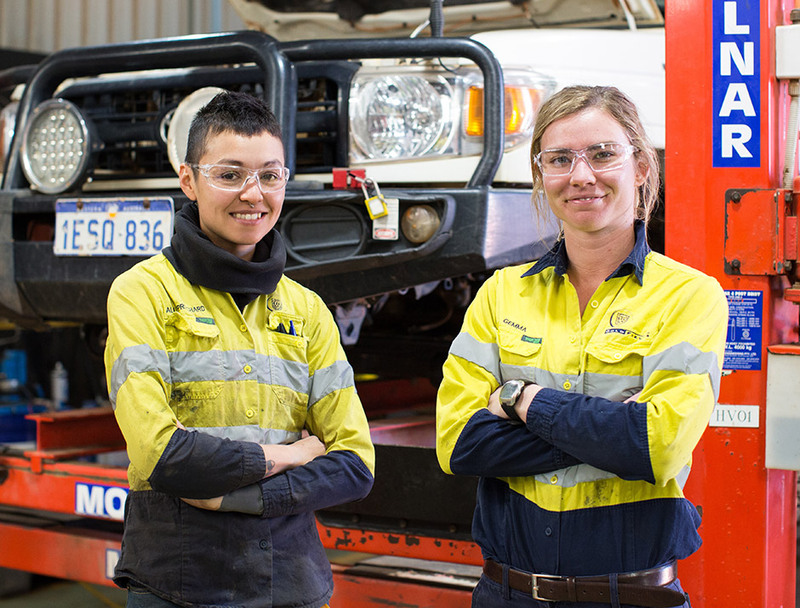 For apprentices Ally Pritchard and Gemma Ruddell, their first few months at our Agnew mine in Western Australia has been a baptism of fire but they’re loving the challenge of their new roles. Prior to arriving on site, Light Vehicle Apprentice Mechanic Ally helped run the café she owns with her husband, following a variety of other jobs in the hospitality sector. “I figured I would get more real time experience with vehicles at a mine site than I would in a city- based apprenticeship,” she says. Underground Electrician Gemma commenced her apprenticeship on the Gold Coast where she spent 18 months working in residential and commercial jobs. “It was a great learning experience,” says Gemma. “But I was more interested in the skills I’d learn in mining. “I didn’t know what to expect working for Gold Fields, but I quickly came to realise that it’s an excellent place to work,” she says. Both Ally and Gemma took a little bit of getting used to their new environment. Gemma says that for her, going underground for the first time was a “crazy experience”. “I’d compare it to riding the Gold Rush rollercoaster at Dreamworld,” she laughed. Ally has enjoyed settling in with her crew, and learning the whole new language of “Fitter talk”. “I quickly found out that I couldn’t get by with pointing to the “thing thing” that goes in “the place over by the blah blah,” she laughs. Gemma has relished the opportunity to learn a variety of different skills from different tradesmen, and learning more about operations in gold mining. “I was surprised how quickly I have made a home away from home, and how well I fit into a department where I am the only female – it’s great,” she says.